NICKY HAYDEN: Race in Peace. Very sad day, he will be missed. R.I.P. Nicky. I remember him in the early days plucked from the us and thrown on a 500cc. His quote was something like "they threw me in the deep end, I didn't drown but man I had to swim". Swim you did champ, all the way to the 06 title, which must go down in history as one of if not the most exciting on record. Tragic loss. Absolutely devastated to hear this news. My condolences to his family who are grieving at this time. Nicky had such a great attitude as a racer. I was always enjoyed hearing him share his opinion on the sport and of course watch him ride. This really is a shame. Nicky came across as a lovely guy. I remember a commentator once asking him about riding a bike for a competitor and him making a comment that you shouldn't take one girl to the prom and dance with another. I was so pleased when he won the 2006 championship despite all of his setbacks. Processing this is still hard and doesn't seem real. You can see how well liked the was and truly will be missed by all. He will always be Kentuckys hometown hero. I didn't know what to write when I heard this. I would be talking crap if I said I'd always been a fan. Back in the old days me and Chops were forever putting down his number of wins in 2006, and argueing with Jum about it. It was all banter, bit of fun, and kept the place nice and lively in those early years. As much as I was pissed off that Rossi lost the title, (which he did in the last race), I had to admire Nicky's consistancy to the nth degree. Would never have admitted that at the time though! Time moved on, and we all met up at Silvo in 2011, The wind ups between us had changed to friendship, Jum sent me a beautiful message when Sic died, and equally beautiful messages when my son died. Spending time with Jum that weekend in 2011, and watcing Nicky finish fouth together (along with the rest of the PS crew) is something I'll always remember. And yes, I became a fan that day. Thanks for the memories Nicky, and thanks for the friendships forged on here over the years. In this mad world, it's good to know that this place is here. Oh aye, and Barry, when you coming hame tae Scotland so I can buy ye a dram? payne by name, Jumkie, Gaz and 5 others like this. Freddie Spencer wrote some thoughts on Nicky as he knew Nicky early on...really kind words from him. I am going to report on the 2017 French Grand Prix at Le Mans, but I’ll get to that in just a minute because I want to talk about Nicky Hayden. As some or most of you probably know, he was involved in a tragic bicycle accident, where he was on his bicycle and got hit by a car last Wednesday. He was hanging on and trying to survive since then. Unfortunately he succumbed to those injuries yesterday and he lost his life. As a racer, we realise what we face on the track every time we get on it. It is part of what we do and we accept that and for many people in many types of lives and jobs that they choose to do. But what makes this shocking is that it wasn’t on the racetrack and he was in the prime of his life after so many years of racing. Not only the way he raced, but the way in which he conducted himself. I want to tell you just a little bit about how I met Nicky. I met Nicky in the early ‘90s at a little racetrack near my hometown of Shreveport, Louisiana in a little town – not even really a little town, but a small little place – called Henderson in East Texas. There was a track called Oak Hill Raceway that actually opened in 1974 and I raced there a lot when I was a kid. I was over there one day just visiting and I had some time off and a man walked up to me and put out his hand, I’ll never forget it, in that Kentucky accent and said to me “My name is Earl Hayden. I have my family over here and they’re young racers and I’d really like for you to come over and meet them.” I said “sure”, so I went over and the first thing I noticed was just the sincerity of this family, beginning with Earl. I met Nicky and his brother Tommy and one of his sisters and they were there racing. I never forget the look in their eyes – these were really young racers and you could tell that they were passionate and definitely had that competitive look. I never forgot that. 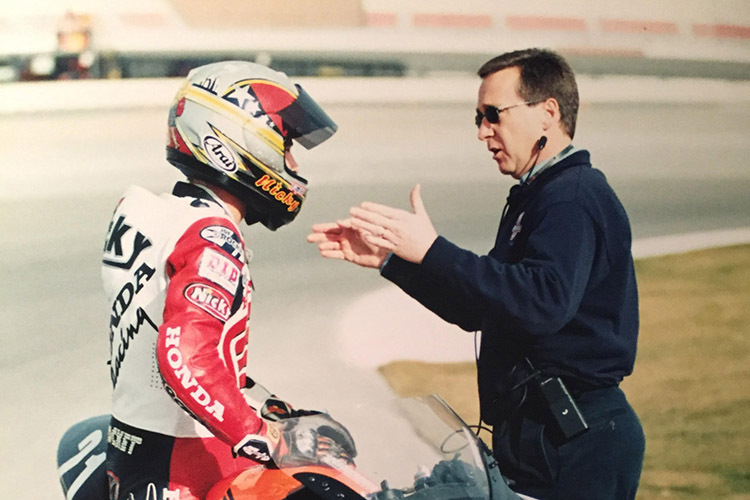 Years later, when I was working with the American Honda Team consulting, Nicky was hired. This was in the early 2000s – 2000, 2001 – and his crew chief Merlyn Plumlee and I go way back. We all worked together and working with Nicky was just a real pleasure. It wasn’t just the dedication on the track but off the track when he came to my school and the laps he would put in. But for me it was more than that – it was the way he interacted with people. He was the type of person that you could see that he was. That was such a real pleasure, to not only work with him but to help him in any way possible. I got the opportunity to go to Japan in 2001 and Mr Ikenoya, who was in charge of the beginning of the Honda RC211V programme, the V5, asked me about Nicky because Nicky was winning the AMA Superbike Championship. He said ‘do you think he can win the world championship?’ and I said “I think he can if you build him the bike”. I’ll never forget that moment when I shook Mr Ikenoya’s hand because I believed in Nicky. Again it was more than just what he could do on the track that mattered. Years later he won the world championship in ’06 and I saw him in Portugal in January for the Honda launch and we hugged each other. He hadn’t changed from that little boy when I met him at nine years old, and that’s what I’m proud of him for - not what he did on track, but for the way he carried himself and didn’t change. You know, in the world that we live in, when you leave your environment – I left Louisiana and Nicky left Kentucky – and you leave that comfort of the family and you go out into the world, it’s not easy – but he did it. He never changed and he always did the best he could. For that I’m very proud of him. He is going to be missed, so to all the family, Earl and Rose, and the family, we’re all thinking of you. payne by name, jbuhl, Keshav and 3 others like this.